Google SEP Abuse: Google was recently busted for anticompetitive abuse of Standard Essential Patents. 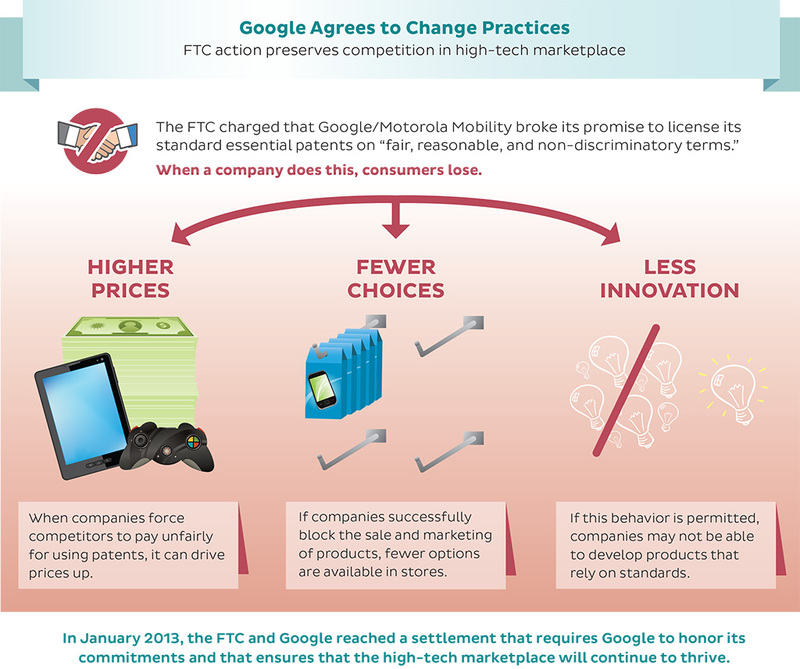 Google had to settle with the FTC in 2013 and the EU in 2014, “because Google/Motorola broke its promise to license standard essential patents (SEP) on fair, reasonable and non-discriminatory terms,” in ways that harmed consumers via higher prices, less choices and less innovation, as the FTC plainly explained in this 2013 chart. Google Search, Android & Advertising Monopoly Abuses: The EU reportedly will sanction Google this summer for abusing its web search monopoly; and the FTC has reportedly reopened its investigation of allegations of Google Search monopoly abuses. On Android, the EU recently charged Google with abusing its search monopoly to create an Android monopoly; and the FTC is reinvestigating that charge as well. Why would the EU or the FTC allow Google, the world’s worst SEP patentabuser, armed to the teeth with 90% search and search advertising monopolies, and a budding Android OS monopoly, to buy potential Yahoo search and advertising patents that are or could become SEP patents that Google then could use to intimidate competitors, like Google brazenly did before? And why would Google want to bring public attention to its advertising business practices by buying Yahoo’s advertising patents when EU antitrust authorities’ are signaling that ad-tech charges against Google may be pending as well. Yahoo’s DOJ Request to Syndicate Google Search: Last fall, Yahoo reportedly asked the DOJ for approval for Yahoo to syndicate roughly half of its searches to Google. Apparently there has been no formal decision unless Yahoo or DOJ did not publicly disclose an approval or disapproval of this request. If Google were buying Yahoo’s search and advertising patents, it would increase scrutiny of why Yahoo is asking the DOJ to allow Yahoo to increase Google’s search monopoly further, when the DOJ in 2008, blocked the Google-Yahoo Ad Agreement by threatening a Sherman antitrust lawsuit against Google, and when Google is alleged to have expanded its U.S. search monopoly to mobile by anticompetitively tying Google Search to a billion plus Android devices. Moreover, Overture is not the only company to sue Google for the same pattern of patent and trade secret infringement. My Precursor blogpost “Stealing from Competitors is How Google Works,” chronicles how Google also did it to: VSL-Max Sound, see here, here, here; Skyhook Wireless, see here, here, here, here; Engineered Architecture, see here, here; BuySafe, see here, here: and Be In-CamUp, see here. Even Google with its rhinoceros thick skin, should not want to kick this veritable hornet’s nest by publicly bidding on, and buying Yahoo’s search, advertising and ecommerce patents. Through the years, many other companies, guilds and associations, have alleged that Google has anticompetitively infringed on their intellectual property: Getty, Yelp, Viacom, Apple, Microsoft, business directories, wire services, newspapers, broadcasters, movie studios, publishers, visual artists, software providers, photographers, artists, graphic designers, illustrators, and filmmakers. Where there is this much smoke there is fire. A Yahoo auction of an important and relevant 1990’s trove of ~3,000 search, advertising and ecommerce patents implicating Google’s proliferating lines of business, may be tempting for Google to bid on and buy, but it should be obvious given the above evidence that Google will either show self restraint and not try, or antitrust authorities will be challenged with the proverbial taunting red cape in front of a bull, to charge Google with antitrust violations. We will see if Google knows better… or not.